25th Anniversary Wishes : Really it’s a great blessing that passing together 25 years of married life. For that couple, there are lots of sacrifices, caring’s, love and happiness through these 25 years. When some of our near and dear ones have the opportunity to celebrate their silver jubilee of married life then you shouldn’t miss the chance to shower them by a happy wish and greeting. 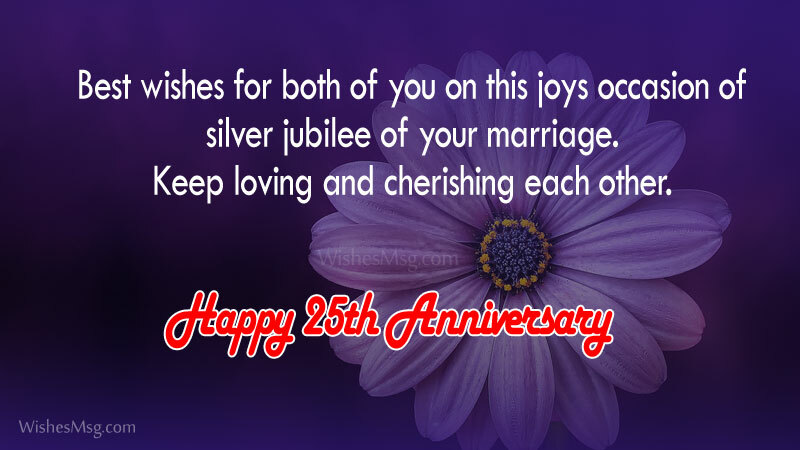 Here in this post we compiled Happy 25th Anniversary Wishes, messages and greetings to share with them who are going to celebrate their 25th anniversary happy marriage. 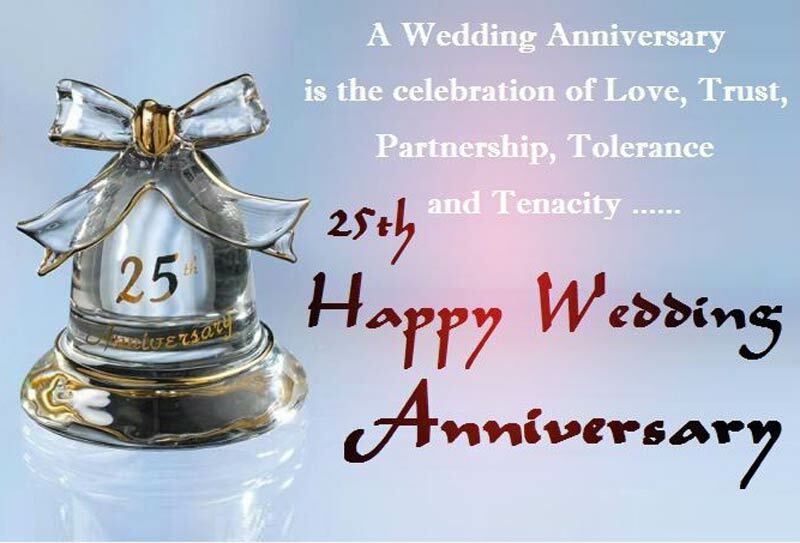 Let’s make a visit through our compilation to get the best 25th anniversary message to wish such kind of happy couple. Only those who are bonded with heavenly love can cross such a long path and still stay together. Your married life is like a story to be told for years to come. It’s not easy to hold on to each other no matter how difficult time gets. You have come this far because you loved each other and trusted each other for life. I have never seen a couple so romantic even after all these years of marriage. You guys will always be my inspiration for how to maintain a happy marriage! There a many happy couples and there are some unhappy couples. But there are so few couples like you who are the definitions of true love and loyalty. I wish you all the happiness in such a special occasion of your married life. You are the most beautiful and romantic couple. My prayers are always with you! So many things your 25 years of marriage has thought, Specially how difficult situations are fought! Happy wedding anniversary! Really, it takes forever to cherish and love someone you really love make the best out of it and be grateful that your together, Best wishes on your 25th anniversary! In each other’s life you bought happiness from day one, So now after 25 years of union, just have all fun! Happy wedding anniversary! Happy 25th anniversary! You guys are still a wonderful couple even after all these years. Wishing you be happy as like as you do these years! It takes a lot of effort and sacrifice to be where you are right now. And for that, I would like to say congratulation and Happy 25th Anniversary! 25 years of relation so pure, You deserve a Hats Off, for sure! Happy wedding anniversary! Today is a special day, For a special couple like you, Sharing a very special love on your 25th Happy anniversary! Make it gorgeous! Have a day that’s really full of fun, It’s your 25th wedding anniversary, from the time you became one! Happy wedding anniversary! It’s really wonderful to sleep and wake up having someone you love beside you and thinking it will be for a lifetime, How wonderful it can be? Happy 25th Anniversary! If there was a couple like you in every family, this world would be so much more romantic, happy and colorful. Congratulations on the silver jubilee of your marriage. Best wishes for both of you on this joys occasion of silver jubilee of your marriage. Keep loving and cherishing each other. Happy 25th Anniversary! Today is the day to be romantic, today is the day to be nostalgic, today is the day to be ecstatic, about 25 years of your marriage… that have been so fantastic. Happy anniversary. Your twenty five year long happy marriage is proof of the fact that fatal attraction is not fatal after all. Happy 25th anniversary. 25 years of commitment, 25 years of attraction, 25 years of care, 25 years of affection. 25 years of romance, 25 years of togetherness, 25 years of love, 25 years of happiness. Happy silver anniversary. Congratulations for discovering the most sought after secret – the secret of a happy marriage. Happy silver anniversary! On your 25th anniversary today, let loose and feel like a teenage couple again. Remember that everything else in life is transitory, and only memories will remain. Happy anniversary. There is nothing more dreamlike than seeing a couple like you; 25 years of love, 25 years of affection and 25 years of care. 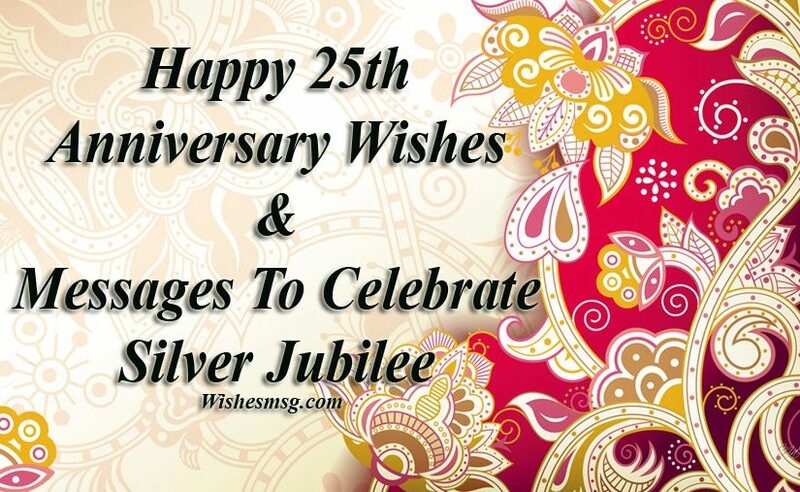 Happy Silver Jubilee! There is nothing more beautiful than love, that lasts forever. 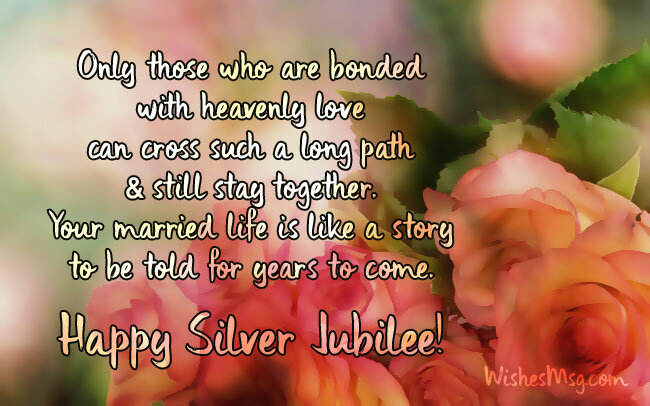 Happy 25th anniversary and silver jubilee of love. Congratulation to your silver wedding. We wish the lucky couple that all your dreams and wishes come true until your golden wedding. Love has little meaning, if it fades away. Congratulations for nurturing yours, till this very day. Happy silver jubilee of your anniversary. May these twenty five years of your married life be the prologue of a fairy tale with a lovely ending. Happy silver anniversary. I pray with all my heart, for you to prosper and to last! Many, many more happy years to come! Happy silver anniversary. Couples like you need to be paraded down the streets so everyone can see what true love really looks like. Congratulations for your Silver Jubilee. Congratulations to you and to your kids. They must have learned by now the true meaning of love, commitment and compromise. Happy 25th and silver anniversary! Congratulations mom and dad for 25 years of togetherness! You are the best parents in this world. I wish you another 100 years of happy, joyful and amazing married life. God bless you! It’s not the number that defines the love you have for each other, it’s the happiness that surrounds you every moment in your life. Happy 25th anniversary dear! I really wish someday me and my partner will celebrate these many years together as you! You two have been such a wonderful inspiration for me. I love you! Congratulations for the 25th anniversary of married life. Thanks for being close to each other and giving us such a wonderful home to be proud of. You proved once again that true love can accomplish anything in this world. I wish you all the best on this special occasion. Only great partners can stay together all these years and raise children with love and care. You are the happiest couple I have ever known. Happy 25th anniversary dear mom and dad! My heartiest congratulations to you as you have completed 25 years together under one roof. Thanks for being an amazing couple and a wonderful parent to us. God bless you! No one in the world would understand you, In the best way you each other do! Happy 25th wedding anniversary! Love would have a better reputation if there were more couples like you and the world would be a better place if there were more parents like you. Happy 25th anniversary. 25 years of walking side by side, For wishing my Mom and Dad a happy wedding anniversary, I take pride! May your love story never have an end, Wish you a very happy 25th anniversary Dad and Mom! Kiss of love and a hug of care, May this relation you always share! Have a great moment! Even a bespoke vintage wine can’t match the beautiful texture and sweet flavor of your twenty five year long marriage. Congratulations for your 25th wedding anniversary. May your marriage bloom like a flower every year, May there be only laughter and no tear! This is a truly amazing time in your life and I wanted to send my thoughts and well wishes to you. Wishing you a wonderful 25th anniversary. From the age of liking each other in class to liking each other on Facebook, your marriage has come a long way. Happy 25th anniversary. Very few women in this world can get a husband like you. I feel really blessed to have you beside me for all these years. Happy 25th anniversary dear! On this very special occasion, I want to let you know that you are the best husband there was, the best husband there is and the best husband there will ever be. I can’t believe we have spent so many years together. It seems like yesterday when we got married. My love for you is still fresh like the day I met you! After all these years together, I can proudly say that, loving you is the best thing I have ever done and taking care of you is the best hobby I have ever known. I don’t remember a day in 25 years without falling in love with you. I fell for you every day and I still don’t know how to lift myself up. I love you! You are the type of husband any woman would die for. I feel lucky every day because I don’t know what good I did to deserve you. happy 25th anniversary! On our 25th anniversary, I want you to know how much I’ve enjoyed annoying you all this time and how excited I am to keep doing so in the future. I am so lucky to have you as my husband and this is my best day in my life. Happy 25th anniversary to you my dear. I love you not just for who you are but also for how you make me feel so many years long. Happy 25th anniversary. All these years, you have been amazing. As a dad to our kids and as my lover, I have been happy in your arms and I could see that we’ll be happier for the rest of our days. Thank you for everything. Happy 25th anniversary, my darling. You complete my life in a way I never thought possible. Happy 25th anniversary to you my darling husband. Our marriage may have been a bumpy ride with many speed breakers, but that is what has made us circumvent those obstacles and fly high in the sky. Happy 25th anniversary. Thank you for being my husband, my partner, my lover and my best friend till so long. Happy 25th anniversary! Among the million unresolved questions about the reasons of human existence, I’ve got the answer to mine – you. Happy 25th anniversary. It’s been an honor to spend 25 years of married life with such a wonderful woman like you. I am looking forward to spend another 100 years with you! It’s the beauty of your heart that kept us together all these years. You came and blessed my life with so many good things that I don’t know how to say thank you! I love you! My life became a piece of heaven when you touched it. You are most beautiful angel god ever sent in this world. Happy 25th anniversary my love. I will love you till my last breath. My life would have been a complete mess by now if you did not enter in it at the right moment. You have added so many colors into it for 25 years now that I feel like I’m in heaven! It takes a lifetime to find a woman like you in this world. But god has been kind to me. He sent you for me and let me keep you for 25 years until now. I love you! You have such a rare combination of beauty and kindness in you. I know even if I search the entire universe I would never find a loving wife as you! Happy 25th anniversary! You are a woman after my own heart. Happy 25th anniversary to you, my wife and my best friend. Like a lock without its key, life would be useless if you weren’t with me. Happy 25th anniversary. I can’t live without you. It may sound absurd. But it is maybe because I love you too much. I wish our marriage can last forever. Happy 25th anniversary, my darling! I feel so lucky to have a wonderful woman, a woman that made my life complete, a woman that makes my day by the time I woke up til I get home from work I Love you so much! Happy 25th Anniversary, dear! Our house would never have become a home without you. Our kids would never have understood the meaning of family without you. I would have never experienced love without you. Happy 25th anniversary. This day reminds me that God really loves me for He gave the most wonderful person and chose her to be my lifetime partner I will always be grateful, Happy 25th Anniversary to you, sweetheart! My darling. Happiness is beyond words. I have understood this once I got married to you. You have always been my reason to live. Therefore I want to grant you happiness in your life with me by your side forever on this very special day. Happy 25th anniversary my dear wife. Congratulations for the both of us for keeping the fire burning till so long. You and our children are blessings from heaven. Love the life with you sweetheart. Tears, smiles, laughter, sadness, happiness, fights will always add spice to our married life. It is complete because of those. It is meaningful because you are there by my side for 25 years long. My sweet wife, you are perfect and every single day is really a blessed day with you. My warmest wishes for you and I love you. More great years for us to come to celebrate together. Happy 25th anniversary. Congratulations both of you for staying together for so long. You have shown us that love and dedication can really make a great couple and a wonderful family! Wish you all the best! You are the most perfect uncle and aunt in this world. There is so many things to learn from you. I wish, after another 25 years from now, you will remain just as happy and romantic as today! We always keep running after love often not noticing that true love dwells in the house just beside us. Happy 25th anniversary to my favorite uncle and aunt! 25 years of happy married life is not for everyone. Only those who can love truly and unconditionally can achieve this milestone. You two are one of those rare people! I have never seen any couple who love each other with such dedication and loyalty. You have proved that age can never fade true love. Happy 25th anniversary! Time only makes true love stronger than before. You two are the perfect example of true love. I am proud for you. I wish you all the best in upcoming years. Happy 25th anniversary dear uncle and aunt! I’d like to congratulate both of you on your 25th wedding anniversary. May God bless you and fill your life with more love and happiness. 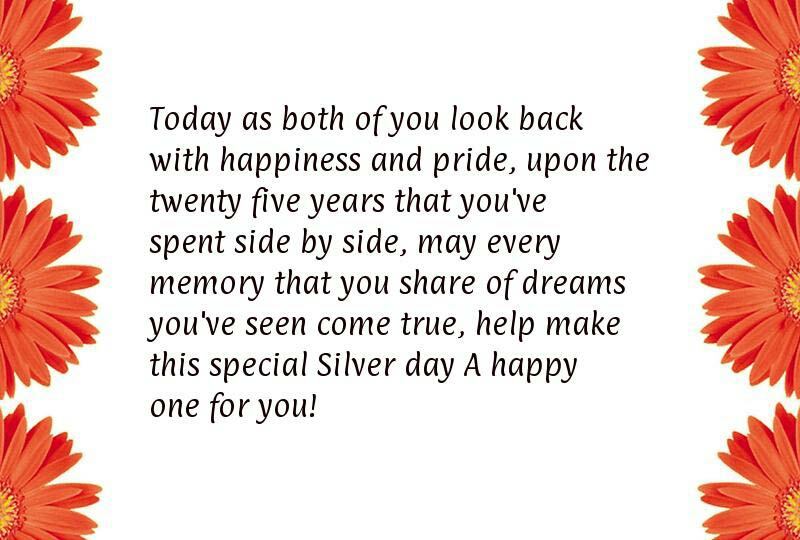 Happy silver wedding anniversary! Dear Uncle and Aunty, this is a special moment today you successfully achieve the 25 years of your love and joy. This blessing of God may be with you till your last breaths. Happy 25th anniversary! Best wishes to both on their anniversary. May the love you share accompany forever. You make a wonderful couple. Happy wedding anniversary uncle and aunty! Best wishes to uncle and aunty, love between you will be forever and countless. You are the wonderful couple on this planet. Happy 25th! 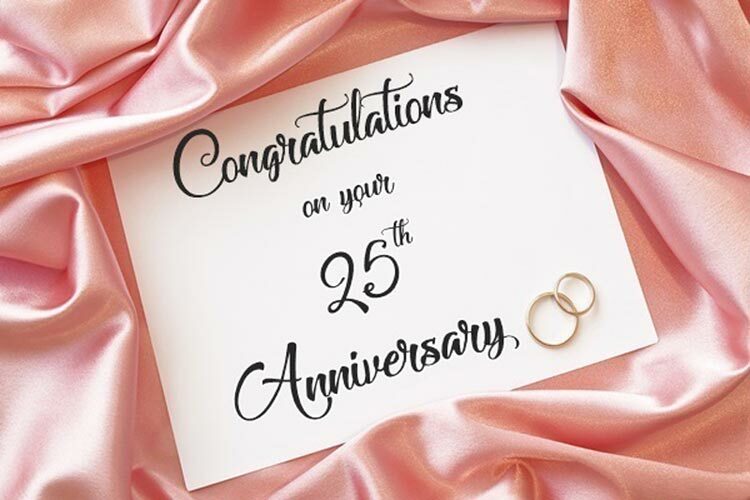 Dear, we feel so proud to share with you the best 25th anniversary wishes and messages which are too amazing to bring a special feel whom you going to greet with these wishes and messages.